It’s been a little over 18 years since The Feelies last graced a stage in Philadelphia but Friday night’s show at Johnny Brenda’s showed that in the intervening time, they haven’t lost any of the power earned them their influential underground legend status. The band Qatsi kicked off the festivities with an enjoyable opening set of jangle pop. 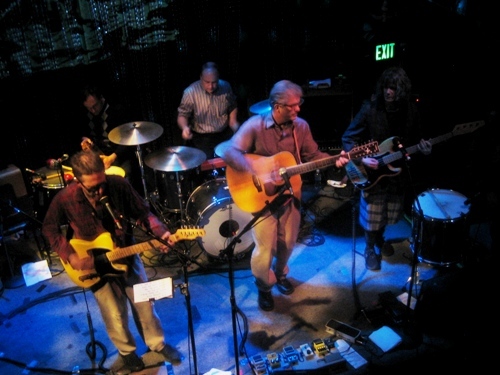 Then, touching on songs from all of their records plus a couple new songs, The Feelies played a finely tuned set that gradually built in intensity and culminated with the frenetic one two punch of Raised Eyebrows and Crazy Rhythms that left the crowd in a frenzy for more. They then upped the energy level a notch by kicking off each of their three encores with blistering covers of the Beatles, Rolling Stones and Neil Young respectively and ending the night with The Modern Lovers’ I Want To Sleep In Your Arms. But don’t just take my word for it, here’s a nice recording of the whole show for you to enjoy as well.